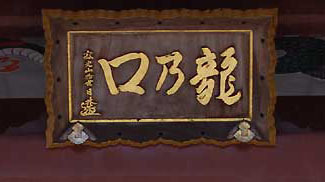 Ryukoji stands on the site of the former Tatsu no Kuchi Execution Grounds, and its names uses the same two kanji. It was here that Nichiren was to have been executed in 1271. 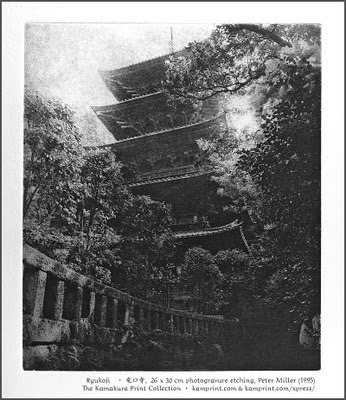 Nichiren was the only man who survived from the execution at this ground. After this event, Nichiren was banished to Sado Island for three years. Nichiren wrote many books and scrolls with the experience of Tatsukuchi. In 1337, Nichiren's student, Priest Nippo, established Temple here in Tatsunokuchi. Major buildings at the temple include the Hondo, a five-story pagoda, a stupa, and the Shichimendo. The cave were Nichiren was confined is preserved on the grounds. A statue of him stands in the courtyard in front of the Hondo. built in 1832. One of the popular Kanagawa style building. built in 1910. Kanagawa's only five-story pagoda.
. Saint Nichiren 日蓮 .
. Temple Honryu-Ji in Kamakura . June, 1271, Kamakura was suffering from a great drought. Nichiren Shonin prayed for rain as did the priest Ryokan-bo Ninsho of the Gokurakuji Temple. Although Nichiren's prayer brought rain and Ryokan's did not, Nichiren was summoned by the court on September 10. Nichiren Shonin submitted his writing, the "Rissho Ankoku-ron" to the government for a second time on September 12. In the evening on that day, he was arrested by Hei-no Yoritsuna who had attacked Nichiren's hut at Matsubagayatsu in August of 1260. At the court, Nichiren Shonin remonstrated the government, "I, Nichiren, am like a pillar of Japan. Losing me is the same as a pillar of Japan toppling down. I predict that Japan will experience domestic rebellion and foreign invasion in 100 days." As a result, the government determined to exile Nichiren Shonin to Sado Island and sent him to Honma's residence in Echi, Kanagawa. However, Yoritsuna planned secretly to execute Nichiren Shonin, so he was taken to the execution grounds at Tatsunokuchi on the night of September 12. At the moment when Nichiren Shonin was to be beheaded, an object shining like the moon at the edge of Enoshima Island flew across the sky like a ball of lightning. The executioner and guards were frightened by the sight and Nichiren Shonin thus escaped execution. 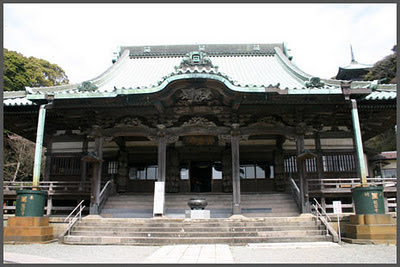 September, 1337, Nippo enshrined the founder Nichiren Shonin's statue and founded the temple. In 1601, a great hall was built.